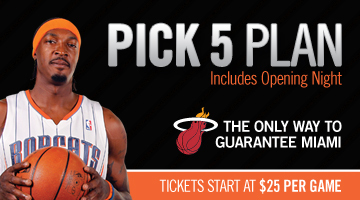 The Charlotte Bobcats have an aggressive ticket marketing campaign that's highlighted by their Pick 5 Plan. For starters, five home games is what I would guess is about the number of games the average Bobcats fan would be interesting in attending, especially in this economic climate when people are clutching their wallets tighter. And the Bobcats have been strategic to make sure you get a five-game plan that makes sense for you and makes dollars for them. The Pick 5 Plan is being advertised as "The Only Way to Guarantee Miami," meaning you can't buy single-game tickets to see the Miami Heat in Charlotte. The Pick 5 Plan is the starting level in which you can purchase tickets to watch The Big Three--LeBron James, Dwyane Wade, and Chris Bosh--take on the Bobcats at Time Warner Cable Arena. They visit Charlotte twice during the regular season. When selecting your five games, you're given three categories of options. The first is required: you receive a ticket to opening night. In the second, you're given the option of choosing one of the games versus Miami (Monday, Jan. 3 or Friday, Feb. 4) or the game versus the Los Angeles Lakers (Monday, Feb. 14). And in the third category, you're able to pick your remaining three games from the other 37 home games on the regular season schedule. So, you can choose some really good NBA games to attend and get tickets for reasonable prices. I would likely choose the package for $225 because those are decent seats and the per-price ticket is about what I would want to pay. The Bobcats have to be strategic in their ticket pricing and how they package them, as do all NBA teams. Forty-one home games is a lot of seats to fill, especially when you're not in a market like New York where you're going to practically sell out games regardless of how good your team is or who they're playing. And as much as fans are excited to see the Miami Heat play this season, LeBron joining D. Wade has more ramifications than countless alley hoops and a lot of teams getting whipped. Many NBA franchises now have two fewer coveted games to market. Instead of the Bobcats drawing big crowds when LeBron and his team visiting twice a year and Wade and his team visiting twice a year, that's now been combined (when the Cavaliers come to town this season don't expect much of a crowd). The Bobcats kick off the regular season October 27 on the road against the Dallas Mavericks, then play their home opener October 29 against the Indiana Pacers. For more details, visit www.bobcats.com. Maybe if The Heat would sell 200 remaining cheap Miami Heat Tickets for $60 instead of $160 they’ll sell out? I’m sure by tonight they will.